With a 100% hand-tied monofilament part and a lace front as well as gloriously perfect barrel curls, Brave the Wave by Raquel Welch is a seasonal stunner that will have you looking chic all year round! - Front: 7.5" , Crown: 9.5" , Sides: 7.5" , Back: 9.5" , Nape: 6"
This season it’s all about swingy, easy-going texture and face-flattering waves. A modern vibe that’s downtown cool, uptown chic. With a 100% hand tied monofilament part and lace front, the shoulder-skimming perfect curls on Brave the Wave will make you look effortlessly perfect! I purchased Brave the Wave in my favorite RW color -- SS10/16 shaded caramel. The color is multi-dimensional-- from dark brown, to caramel to pale blonde, which is perfect for me as I am not ready for anything deliberately gray. This color hints at a little salt and pepper, giving the look of excellent salon highlights. The curl does require a bit of bravery to pull off. I purchased this wig for a formal event, intending to pin it up with small butterfly clips to tame the volume. I also trimmed a bang, which looks wispy and natural. Pulling a few tendrils out to frame my face gives me the elegant effect I was going for. 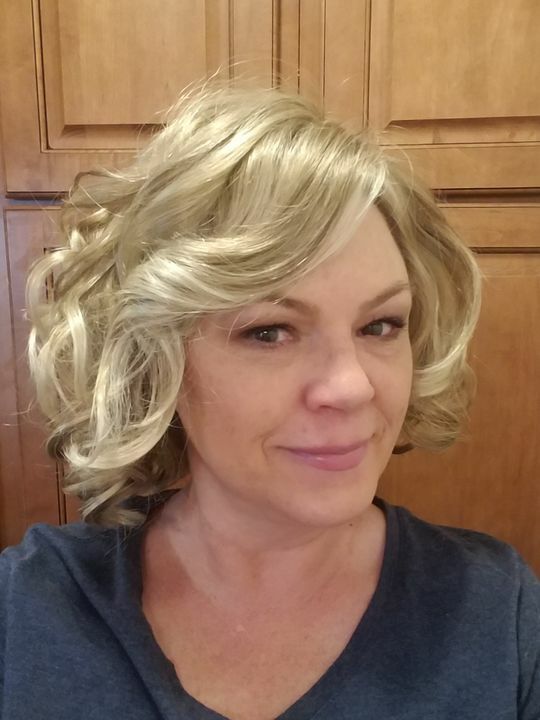 Denise Corvin (Retro G. Reviewed by Denise Corvin (Retro G.
I wear wigs as a protective style and because I suffer from pain in my neck, arms and hands that can make styling my own hair more difficult. This is my first higher quality wig purchase and certainly will not be my last! I am very happy with this wig. I got her in glazed sand which is a beautiful blond color, although I wish she were rooted. Aside from color, the fibers are wonderfully soft and the curls are fantastic. I'm only purchasing grey because I'm going to begin to transition to my natural grey color. I purchased two of these wigs when there was a great sale. The color I got was Shaded Sugar Licorice...beautiful color and I LOVE the way it looks on me! I also really appreciate that it is not one of RW's heat tolerant fiber (I am not a fan of that fiber), and the cap is very comfortable (I'm a 23 inch circumference) I'm so glad I purchased them! Thanks, Cysterwigs for the awesome sale!! Gail M. Reviewed by Gail M.
I love this wig. It fits great and the color, Glazed Strawberry is a beautiful frosted strawberry blonde. I love dealing with CysterWigs. Geraldine W. Reviewed by Geraldine W.
I love this wig Brave the wave . I just had to run my fingers thru the hair and it was ready to wear. I will be ordering this wig again.